The CONVERSION DURATION THRESHOLD placeholder was deprecated on April 28th, 2014. Starting July 21st, 2014, using this placeholder with the FeedMappingService will result in a FeedMappingError.INVALID_PLACEHOLDER_FIELD error for all AdWords API versions. See this post for details on how to set your conversion duration going forward with the CONVERSION TYPE ID placeholder instead. If you have any questions about this upcoming change or anything else related to the AdWords API, please contact us on the AdWords API forum or via the Google Ads Developers Google+ page. This entry was posted in Google Ads Developer Blog and tagged AdMob, Ads, AdSense, AdWords, adwords_api, conversion, Developer, DoubleClick, feeds, sunset on June 30, 2014 by Google Ads Developer Advisor. We're enthused to announce a new version of our Mobile Ads SDK for Android. Our big change for this version are our new Custom Event APIs. After updating our mediation APIs in our last release, Custom Events were up for a refresh. Our new-and-improved Custom Event APIs make it even easier to implement your own mediation adapter or show a custom view in your ad space. Remember that after August 1st the Play Store will no longer accept submissions using the legacy SDK, so please update your apps to use the latest version of Google Play Services. For a full list of SDK changes, check out our release notes. For technical questions, post them on our forum. We're stoked about these improvements, and hope you find them useful! This entry was posted in Google Ads Developer Blog and tagged AdMob, Ads, AdSense, AdWords, Android, Developer, DoubleClick, mobile_ads_sdk on June 30, 2014 by Google Ads Developer Advisor. The World Cup continues to inspire feverish discussion around the globe. Here are some highlights from our search results from the second week of action. Dutchman Robin Van Persie's flying header won honors for the best goal. Brazilian striker Neymar won for the most searched hairdo. Englishman Howard Webb lost out for the most searched referee to a Japanese rival. Find out more about World Cup by tuning into this special trends edition. This entry was posted in Google Europe Blog and tagged Europe, Google Trends on June 30, 2014 by bechikson. From conceiving the Hills Hoist to inventing the bionic ear and WiFi, Australia has a rich history of innovation, fuelled by a desire to solve tough problems with technology solutions. We believe technology can help solve some of the world’s most pressing challenges, and today we’re announcing a new program to support Aussie innovators in the new program to support Aussie innovators in the non-profit sector who want to use technology to make an impact. 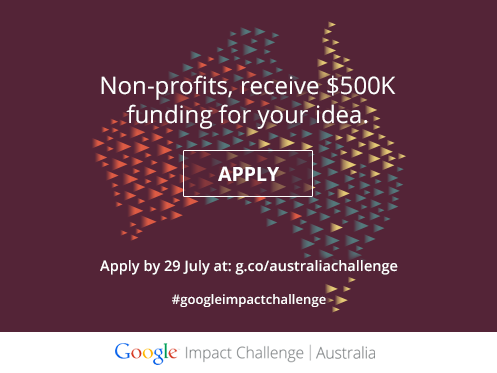 Starting today, Australian non-profits can submit their technology-driven ideas to Google Impact Challenge | Australia for the opportunity to share in $2 million of funding. We’ll reward the four winning submissions with a $500,000 grant plus mentoring and support from Google employees to help make each project a reality. Australian non-profits with DGR status can apply online today at: g.co/australiachallenge. We’ll announce ten finalists in October, and then open up public voting so Australians can select their favourite idea. On October 14, a judging panel made up of Glenn McGrath, Kim Williams, Anne Geddes, Maile Carnegie and Jacquelline Fuller will select three awardees. The fourth awardee will be chosen based on online votes from the public. Other Google Impact Challenges around the world have supported ideas ranging from smart cameras for wildlife conservation to solar lights for off-grid communities to a mobile application that helps to protect women from domestic violence. Non-profits, you have four weeks to submit your ideas. Entries close on July 29. Whether it’s new technology to help alert residents of an approaching bushfire or an innovative way to tackle homelessness in a CBD, we look forward to hearing some big ideas about how technology can make a real difference to tackle some of the world’s biggest social challenges. This entry was posted in Australia Blog and tagged Australia on June 30, 2014 by Johnny Luu. The Google PhD Fellowship program supports PhD students in computer science and related fields, and is part of our commitment to building strong relationships with the global academic community. To date we’ve awarded 193 Fellowships in 72 universities across 17 countries. In our most recent round two Australians have been recognised for their efforts. Guosheng Lin, from the Australian Centre for Visual Technologies at the University of Adelaide, was awarded the Google Australia Fellowship in Machine Perception Research for his work in binary code learning with deep neural networks for image retrieval. Guosheng’s research is focused on exploring fast and accurate machine learning techniques for solving large-scale object recognition problems. Kellie Webster, from the School of Information Technologies at the University of Sydney, was awarded the Google Australia Fellowship in Natural Language Processing for her work in efficient cognitively informed coreference resolution. Kelly’s research is focused on working to improve coreference (that’s when two or more pieces of text refer to the same thing) resolution simultaneously in two dimensions, by more faithfully representing cognitive and psycholinguistic insights to improve the time and space efficiency of our coreference resolution system. This program recognises and supports outstanding PhD students pursuing work in computer science, related disciplines or promising research areas. Australia’s two recipients are a part of a cohort of 38 outstanding PhD candidates from America, Canada, Europe, China, and India. By supporting these two Australian Fellows we recognise their significant academic achievements and hope that they will go on to be leaders in their respective fields. We look forward to building even stronger links between industry and academia to help push important research forward in Australia. We recently received a report via our Vulnerability Reward Program of a security issue affecting a small subset of file types in Google Drive and have since made an update to address it. Please refer to the post on the Google Online Security blog for details. This entry was posted in Apps Feed Blog and tagged apps, Google Drive on June 28, 2014 by Jane Smith. If you use a Braille display, you can now enable Braille support in Google Docs, Slides and Drawings to read and enter text. This option is currently available for Google Chrome and Internet Explorer. This entry was posted in Apps Feed Blog and tagged apps, Google Docs, Google Drawings, Google Slides, Rapid Release, Scheduled Release on June 27, 2014 by Jane Smith. A few months back, we launched a campaign to encourage creative partners to Get Studio Certified. Since then, we've focused on improving our training content to help developers grow their skills and get more comprehensive Studio training. As we continue our revamp of the DoubleClick Studio Certification program, we're thrilled to announce our new Studio Certification study guides. These guides bring Studio training content from presentations, videos, & separate help articles into a central location in the Rich Media Help Center. Use these guides to walk through the details of exactly what you need to know to pass each exam. Updated QA badge: The QA badge guide covers all areas for testing Flash, HTML5, and dynamic creatives. If you took the QA Certification exam before March 13th, 2014, you'll need to get re-certified with the new QA badge by July 1st, 2014. Advanced badges: Engagement ads, Dynamic creative, YouTube mastheads, & VPAID. Visit the Rich Media Help Center and try these guides today! Questions about the Studio Certification program? Download our Certification poster to learn the benefits of getting Studio Certified (including a few tips and tricks). Find out more in the Rich Media Gallery. Even if you're already certified with one badge, keep developing your skills by reviewing the new training guides and getting certified with new badges. Reminder: If you took the QA Certification exam before March 13th, 2014, you'll need to get re-certified with the new QA badge by July 1st, 2014. This entry was posted in DoubleClick Advertiser Blog and tagged Ads, Advertisers, DoubleClick, DoubleClick Rich Media, doubleclick studio, Studio Certification on June 27, 2014 by Josh Pyle. A century ago, a Serb nationalist assassinated Austrian Archduke Franz Ferdinand, sparking World War I. Today, we are launching a new channel dedicated to commemorate the war’s centenary. It brings together World War I content, paintings, photographs, letters, documents, soldiers’ poems and more, from a range of Museum partners, ranging from the German Federal Archives to the Belgian Mundaneum to the Imperial War Museum. A search for Franz Ferdinand brings up photos relating to the Archeduke’s assassination. They show the Franz and his wife Sophie arriving in Sarajevo. Outfitted in regal dress, treated with the pomp and circumstance of royalty, they stroll through the streets. A final image shows police arresting Serb assassin Gavrilo Princip. Other exhibits explore the art around the conflict and personal impact of the conflict. Belgium’s Mundaneum has collected postcards sent from POW camps. The Imperial War Museum’s features Christopher Nevinson's bleak landscapes. The British authorities censored some of the paintings for being too “negative.” At the same time, the museum also features John Nash’s patriotic paintings. The German side of the war is well represented, with more than 200 new items in 13 new exhibits. Items include photographs, newspapers, letters, army documents, ration cards, and unusual items like the anti war poem written by a German soldier which lead to his detention. Exhibits range from German policy around the Sarajevo assassination to the rise of German airships to problems of nutrition due to the conflict. The exhibits are designed for for a wide audience and full of exciting details for specialists. More content will be added over the coming months and years as commemorations around the Great War continue. This entry was posted in Google Europe Blog and tagged Belgium, Culture, Europe, France, Germany, United Kingdom on June 27, 2014 by bechikson. This entry was posted in Australia Blog and tagged Australia on June 27, 2014 by Johnny Luu.